Our Steel and Brass Drink Holders are available in blade-style and drop-in styles, with or without matching Ashtray Screens. We also offer Plastic Drink Holders in regular and mug-fit sizes. Our blade style drink holders are made of durable acrylic. You can choose from standard size and jumbo size drink holders, which are both available with "mug-fit" handle slots on the sides (each mug-fit holder has cut-outs for a mug handle). These Standard Size Acrylic Plastic Drink Holders (both standard and mug cut) have an inside diameter that measures 2.75". 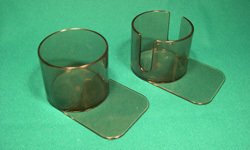 The Large Size Plastic Acrylic Drink Holders (both standard and mug cut) have an outside diameter of 3-3/8". Regular Size Drink Holder Sale Price: $1.90. Was $3.95. Save 52%! Mug-Fit Drink Holder Sale Price: $1.90. Was $3.95. Save 52%! Our drop-in drink holders are available in stainless steel and brass finishes. Steel Sale: $4.49. Was $6.95. Save 35%! Brass Sale: $4.86. Was $9.95. Save 51%! 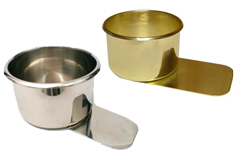 Our jumbo drop-in drink holders are available in stainless steel and brass finishes. Each jumbo drink holder is 2.25" deep, with an inside diameter of 3.5" and a 3.54" outside diameter. Our Las Vegas quality drink holders are blade style. 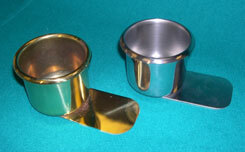 Metal (stainless steel) drink holders and anodized brass drink holders are available. 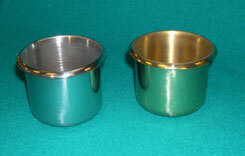 These Standard Size Metal Drink Holders have an inside diameter that measures 2.75". Steel Sale: $5.95. Was $7.95. Save 25%. BrassSale: $6.25. Was $11.25. Save 44%. Our jumbo Las Vegas quality drink holders are blade style. 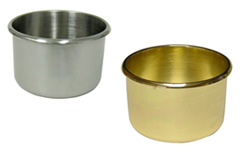 Metal (stainless steel) drink holders and anodized brass drink holders are available. Each jumbo drink holder is 2.25" deep, with an inside diameter of 3.5" and a 3.54" outside diameter. 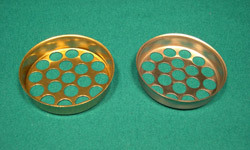 These metal ashtray screens are available with stainless steel or anodized brass finish. They fit our Drop-In Drink Holders. Feel free to browse our selection of Blackjack Accessories, Insert Trays, and Billiard Cloth Layouts. For more information on our Blackjack Table Drink Holders, please contact us at 1-800-233-0828.